"This summer, Arctic sea ice shrank to its third-lowest area on record." Do they expect the ice to recover immediately following the 2007 record low? 2008 was the second lowest, 2009 was the third lowest and 2010 will likely be the fourth which clearly shows that Arctic ice is recovering. As a matter of fact it is recovering at a rate of about 30% per year. The fact that the oil companies are taking more notice of the number of bears is likely an effort to discredit warmers' claims of declining bear populations. This is probably purely profit oriented even though bear populations are increasing in all areas in the world except for two and those two are from human pressures that have nothing to do with global warming/climate change. Great article... why doesn't Man stay out of that area??? Really upsetting to me, then the article states the incidents are incidential...WHAT??? They are intruding on an area that is under so much threat from Global Warming it is crazy, then we have to get up there and drill for oil? For Petes Sake, ride a bike! Leave this area alone, right now it will probably never recover and we will lose all of these special and wonderful creatures, glacers etc...way to much GREED and unfortunately at the expense of all of these animals and what was once a beautiful and special area. Super news article, but MAN needs to BACK the BLANK OFF!!! Frankly it will be a little to late I fear! The criminal justice systems have statistics that show the majority of serial killers and others who commit hideous crimes against others abused animals at a young age. We as a society in my lonely opinion have a congress and house of representative who sponsor corporations by giving them the ok to do anything to animals in the name progress. 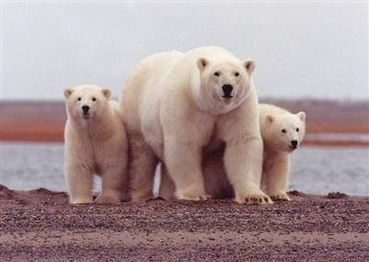 Let's protect the North Slope and protect all the polar bears, and then nobody gets hurt. It's time to stop polluting, stop damaging habitat, stop killing wildlife , stop shoving wildlife out of their areas, and stop acting like we don't care about the future and future generations. Man intervene and man is going to pay dearly for these mistakes.